"What we did for our service project is explain to people that community violence is bad. And we were people from the future telling them that violence is bad. We made a poem and played different parts. We were trying to convince people that that violence is bad so that we can have peace! We gave ideas about stopping violence, We said how to stop it in many different ways. One idea is by making a poem and showing it to people. And melting the world's guns and making them into pans, forks, spoons, and knives to help feed people instead." Our Service Project is about ending community violence, police violence, and ending the cycle of gun violence that exists. For our service project, we created a poem-play to educate people and raise awareness about violence so that we can stop gun usage and end violence. The purpose of our poem-play Service Project is to end violence by showing how things are today, and by imagining and showing the future we want so we can create it. Our poem-play is made up of Point of View poems. The points of view are characters who are Police Officers, People without Power or Opportunities, and People with Wealth and Power. In our poem-play, these characters speak to you from the future we want to create about what it is like for them, and remembering what it used to be like for them when they lived in our time; what it’s like today. 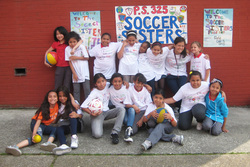 To encourage girls in our school community to play more sports, we had a girls' field day yesterday. We will post more details next week!